Possibly the greatest adventures of them all – take to the air in a Gulfstream G550 Jet to fly into the polar circle. Here you will sleep under skies that never get dark and encounter some of the world’s greatest natural wonders. Whichaway presents an opportunity to stay in a luxurious camp in one of the remotest corners of the globe. The camp is run to strict environmental guidelines, minimising impact on the environment whilst maximising comfort, style and experience. Accessible only by private charter flight from Cape Town, and with space for just 12 guests, Whichaway Camp is truly a once in a lifetime adventure. Unlike most expeditions to Antarctica, which focus on cruising the Antarctic peninsular, this expedition takes you deep into the heart of the continent to the South Pole itself. With six luxurious sleeping pods, each designed for two people (although pods can be adapted for solo travellers), the ambience combines true expedition with modern luxuries: all pods are heated and spacious with writing desks and private washing facilities. Cutting edge materials are used throughout, though the feel of the interiors is decidedly old-world. 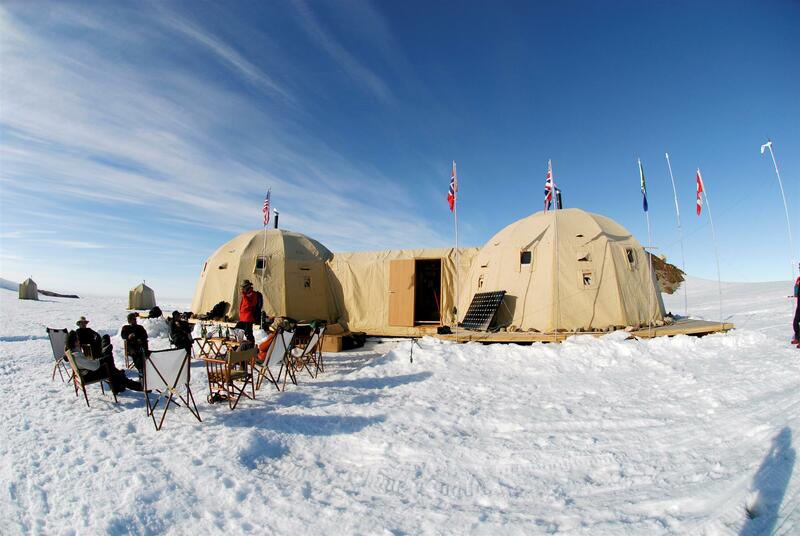 The camp also offers a cosy lounge and dining room to relax and enjoy excellent food from an award-winning chef. The overarching ethos at Whichaway Camp is ‘experience as much as you wish or as little as you like’ and the team put high value on making this your adventure to take at whatever pace you wish – this means excursions range from gentle hikes to mighty abseils with ice-picnics, rock climbing and kite skiing in between.